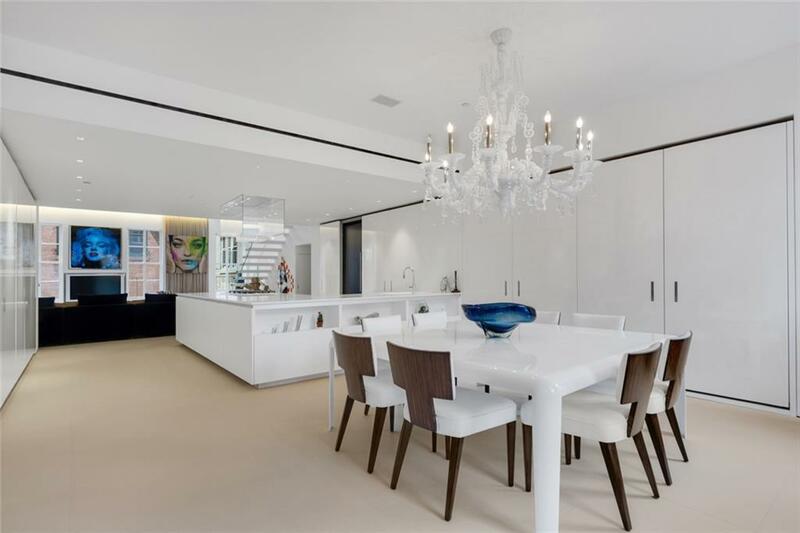 As soon as you enter this glamorous four bedroom and three-and-a-half bathroom penthouse spread over two floors, the scale and elegance will take your breath away. 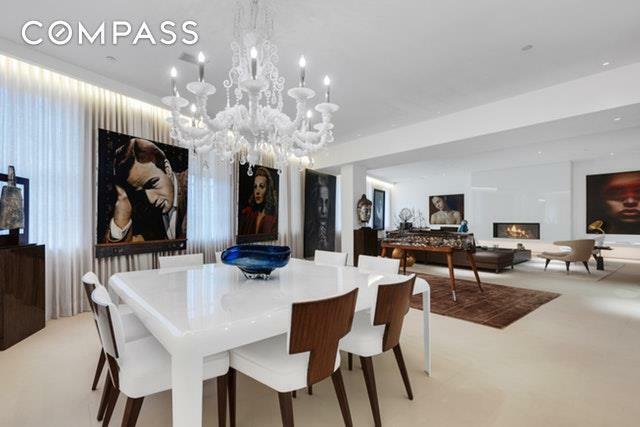 Spanning 4,500+ square feet and accessed by private keyed elevator, this loft-like residence is spectacular on every level, from its luxurious finishes, to the vast 1,452 square foot terrace, and space of incredible volume and proportion. Crafted by Piero Lissoni, this perfectly scaled penthouse reflects a contemporary aesthetic with striking finishes including Italian white limestone floors throughout and kitchen and bath systems by Boffi. On the main level, the living and dining areas showcase the open layout with lofty ceiling heights of 10'9" and three entertaining spaces. Anchored by a woodburning fireplace, the expansive living and dining area measuring 49' x 31'7" features six oversized windows framing East city views, and a second gracious living area is positioned to the West. Joining these three entertaining spaces is the open, eat-in kitchen exquisitely finished with Boffi cabinetry, white Corian counters, and premium appliances, including a Miele six-burner vented cooktop, two Miele ovens, Miele drawer warmer, Miele dishwasher and separate Gaggenau refrigerator and freezer. The powder bath with stunning glass vanity is adjacent to the laundry room, equipped with full-size washer and dryer. Completing the main level are two bedrooms with built-ins and an ensuite bath. The main level layout and its generous proportions affords the flexible use of space. 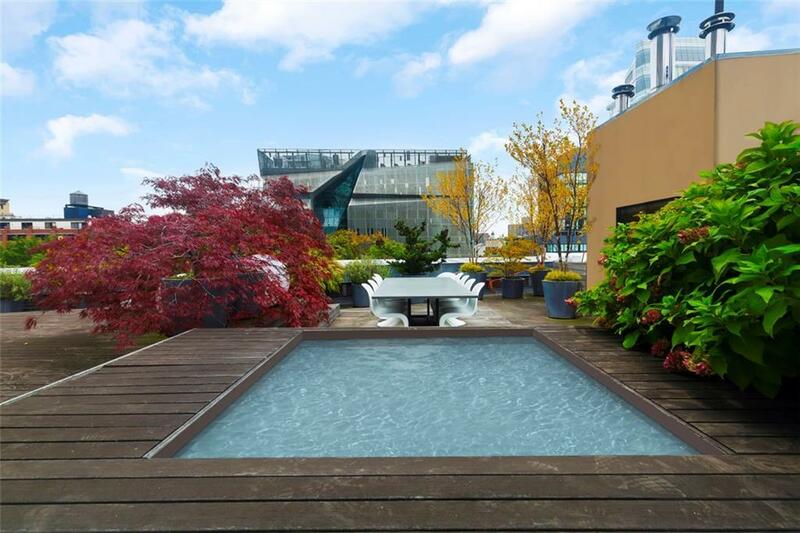 A stunning glass and limestone staircase leads to one of Downtown's most impressive private terraces and two bedrooms with ensuite baths, including an incredible master suite. Multiple seating and dining areas, a television, grill, fresh water hot tub, landscape planters, irrigation, sound system, and light create ambience during the day and night. The outdoor and indoor living spaces are transversed by a wall of twelve windows to the East and elevated by 9'10" ceiling heights. The master suite features an en suite bath with dual vanity, separate shower with rain showerhead, large Corian soaking tub, and a water closet with glass door. Other fine features of this home include abundant storage, custom built-ins and millwork, radiant heated floors, custom lighting, central heating and air conditioning, and a Crestron system with two iPads that controls all lighting, media/sound, and window shades. The Carl Fisher Building, built in 1926 and converted to 26 residential condominiums in 2001, is located in the heart of Noho where you're moments away from SoHo, Union Square, Greenwich Village, and East Village and the 6, N and R trains. Amenities and services include 24-hour doorman/concierge, on-site super, common roof deck, and access to the New York Health and Racket Club. Storage unit transfers with this property. Listing courtesy of Toni Haber of Compass.